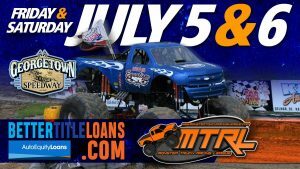 BetterTitleLoans.com presents Monster Truck Madness at Georgetown Speedway on Friday, July 5 and Saturday, July 6, 2019 – complete shows each night! 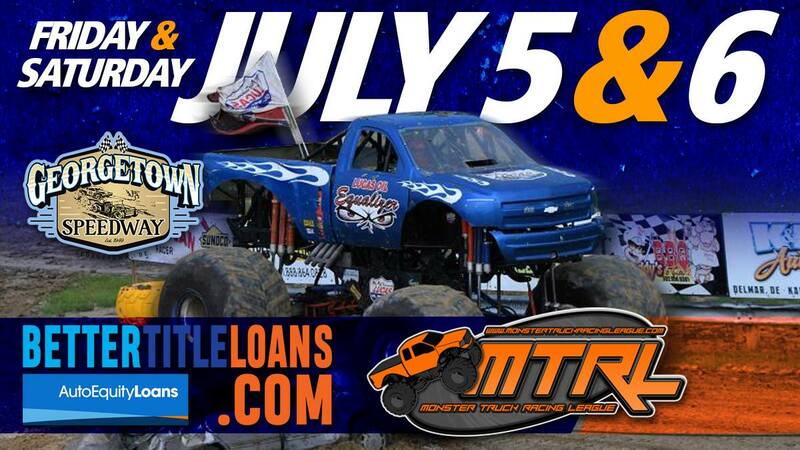 See famed BIGFOOT live and in person joined by Snake Bite and a fleet of Monster Trucks from the Monster Truck Racing League (MTRL). Don’t miss the popular Quad Wars as seen on national television! Families will enjoy a night of entertainment with excellent food from Fat Daddy’s BBQ, FREE Parking, a pre-show Meet & Greet and post-show Autograph Session! Advance Ticket holders will receive a gift upon entering the speedway and will be permitted to enter one-half hour prior to the grandstand opening for walk-up sales. Pre-Show Meet & Greet: 5:30-6:30 p.m.